In South Africa, an inexpensive ring lock folder is sold everywhere. It’s a good design, but it’s constructed from sub-standard materials, is poorly made, and is horribly overpriced. And yet, millions of these knives are sold there each year. Well, we thought we could do better, in the quality of materials, cutting performance, and in price. The Cold Steel Kudu, takes some cues from its South African competition, but our version is vastly superior. Ours has a Krupp 4116 Stainless steel flat ground blade, heat treated to Rc 56-57 for better edge holding ability and ease of re-sharpening, and a thin razor sharp edge. The handle of the Kudu also reflects our dedication to making an effective and affordable folder. It’s made of 43% glass reinforced Zytel®. This material has proven to be extremely strong, and is stiff enough to compliment the blade and spring when locked open. Plus, the gripping surface has a wood grain texture for traction and features an attractive polished steel Kudu horn emblem for a little extra flair! 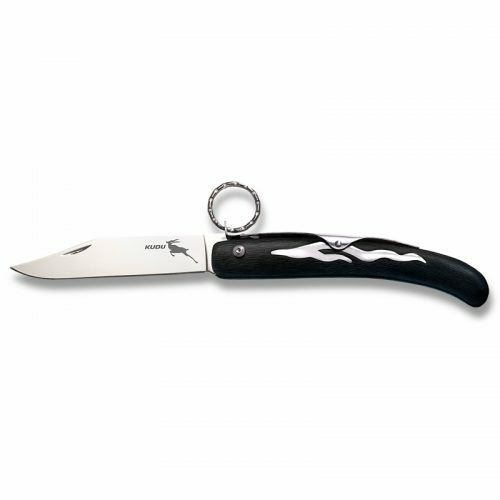 We think the Kudu represents an unbelievable value. 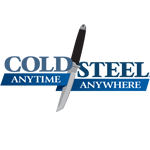 It’s ready for anything and makes a wonderful work knife, utility knife, bait knife, or hunting knife.